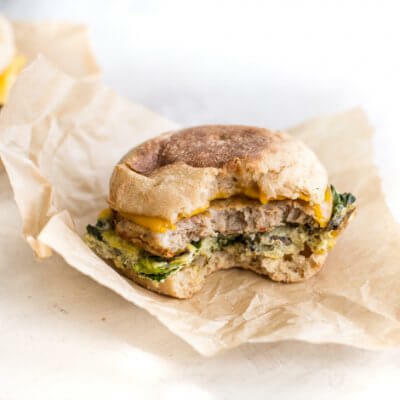 Freezer Breakfast Sandwiches that are healthy and make an easy breakfast meal prep! Chicken breakfast sausage, cheddar cheese, english muffins and all the veggies in a baked egg casserole. Preheat oven to 450 degrees F’ line rimmed baking sheet with parchment paper. Drizzle oil on baking sheet, arrange veggies on pan and toss to coat in oil; season with salt, pepper and italian seasonings. Bake for 10 minutes. When veggies have finished roasting, remove sheet pan from oven; gently stir vegetables and then spread out again on baking sheet. In a large bowl, whisk together eggs; beat well. Pour eggs over veggies in sheet pan; bake in oven for 10-12 minutes, until eggs are fully cooked. Remove baked eggs from oven and cut into 12 even squares. Assemble breakfast sandwiches by stacking baked eggs, cheese, and chicken sausage on english muffins. Prep muffins for freezer by wrapping each breakfast sandwich individually in plastic wrap, then in aluminum foil, date and label, and then place in freezer safe gallon bag. Before reheating, defrost the breakfast sandwich by placing in the fridge overnight or in microwave on defrost setting for 1 minute. Then heat muffin on high power in the microwave for 1 minute to 1 minute 30 seconds, cooking until eggs and sausage are headed through.